I’ve never been one to gloat about the recruiting rankings, especially when the difference between Florida and another school is four thousandths of a star rating. Of course, those rankings aren’t without merit, but they aren’t everything, either. In the simplest terms, what I really want are ballers. And Dan Mullen went and got them en masse. Few defensive backs in this 2019 class command fear and alter offensive game plans the way Elam does right off the bat. The Under Armor All American has a frightening combination of size and strength, and runs a 4.5 40 yard dash to boot. And this is pre-Nick Savage, keep in mind. He’ll need to grow a little bit more and adjust to the speed of the game in order to play right away, but in terms of pure potential, this kid is a gold mine. He may need to wait a year or two to fully blossom with the presence of Marco Wilson, CJ Henderson and Trey Dean in that secondary, but we’re talking All-American and first round NFL Draft pick potential when it’s all said and done. Zip, as he’s called, is basically a wide receiver at the tight end position. That means placing a linebacker on him in coverage is an excellent way to cede large chunks of yardage at one. The measurables are utopian for a tight end: a 4.61 40 yard dash, 4.53 shuttle, and a 33.6 inch vertical leap. But Zip also has a knack for the game the way few others do. This kid is adept at high pointing the football, and has running back like moves when running his routes. Like Elam, don’t be surprised if he ends up on an All-American list and selected in the first round of the NFL Draft. I go back and forth with Diabate, Diwun Black and Tyron Hopper for this superlative, but I’m ultimately going with Diabate here simply because he’s already enrolled and living on campus. Florida has a glaring need for linebackers after the somewhat unexpected departure of VoSean Joseph, and while supremely talented, David Reese has a history of injuries. Diabate has strong measurables for a linebacker: a 4.59 40 and a 4.44 shuttle combined with a 38.1 inch leap has to make Todd Grantham drool with excitement. But he’s also a supremely intelligent kid who figures to grasp Grantham’s scheme quickly. Given Grantham’s emphasis on the middle level of the defense, he’s a relatively good bet for freshman All-SEC honors. Tarquin is actually the smallest of the seven linemen Florida signed (6’6, 290) but man, does he have prototypical blind side protection skills. It’s rarely wise to say this about an incoming freshman, so I’ll cue it up with the standard warning that you never really know about recruits until they step on the field, but he could very well be one of the best offensive tackles the Gators have ever signed. His only real weakness is his relatively small frame, but an offseason with Nick Savage should fix that. Meanwhile, the positives: he explodes off the snap, possesses ridiculously quick feet, and is capable of full blocking with all the fervor of Michael Oher. With the mass exodus of linemen following the 2018 season, pencil him in as a starter at one of the two tackle roles in 2019. Honorable mentions for this include Chris Steele (importing him from California), Diabate (taking him right out of Auburn’s backyard) and Tarquin (flipping him from Miami). But to go and steal a recruit away from Nick Saban and Alabama- particularly one that he really wanted- is a Herculean feat. It’s the rough recruiting equivalent of walking into Tuscaloosa and beating the Crimson Tide in Bryant-Denny on a last second field goal. True, he’s from South Florida, but 99% of the time, when a kid commits to a school live at a high school All-American game, that’s the end of it. Major props to Todd Grantham for this flip. Florida actually appears to be as well off in the QB room as it has been since the departure of Tim Tebow: Feleipe Franks came on strong in the last third of the 2018 season, and Emory Jones has displayed flashes of pure brilliance. But do not for the life of you exclude Jalon Jones (no relation) from consideration, if for no other reason than if you include Franks’ benching against Missouri due to incompetence, the Gators have had to resort to using its backup QB every single season since 2008. Jalon is a smart kid, so he figures to grasp the offense pretty quickly, and is a true dual threat in the sense that he can easily burn you with his feet and his arm (as opposed to Treon Harris, who could only beat you with his feet). If he can shore up some of his throwing mechanics, and he gets the chance to play, he could be the real life version of a video game create-a-player for this offense. Overall class of 2019 grade: B+. Dan Mullen and his staff reeled in a great class by every objective metric. He filled needs on the offensive line, at linebacker, and the annual need at quarterback. He signed a plethora of potential ballers, including Steele, Elam, Bogle, Tarquin, Diabate, Black, Hopper, Zipperer, Nay’Quan Wright and Lloyd Summerall. 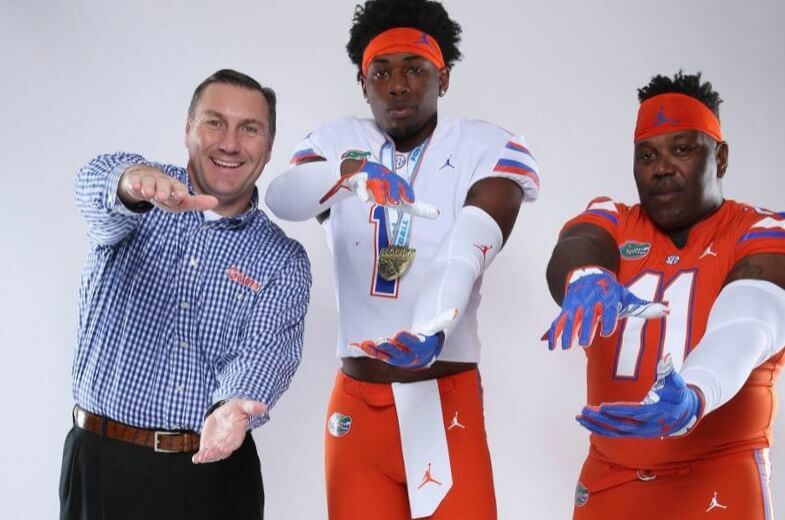 The only way this class could have possibly been better would have been if the Gators signed one of the unanimously rated five stars they were after, like Kayvon Thibodeaux, Trey Sanders, Derek Stingley or Nakobe Dean. But for all intents and purposes, Mullen did his job. Say what you want about the rankings, but every major scouting service says this is one of the ten best classes in the nation. Now it’s time to coach ’em up.